In a one point perspective drawing everything seems to diminish as the objects recede into the distance and eventually disappear or vanish at a point in front of you. 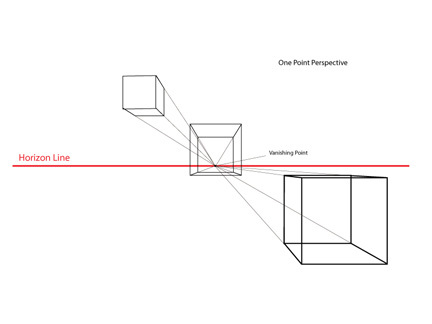 As we look into one point perspective there some key terms to know; horizon line, vanishing point, and orthogonal lines. The horizon line is the eye level of the viewer. This line sets up the orientation of the scene and gives the viewer some bearing as to how the visually relate to the image. In exterior scenes or other scenes where the outside is shown the horizon line is often where the sky meets the ground. Be careful as the horizon, or the point where the sky meets the ground is not always visible so its best to think of the horizon line as being at the viewers eye level. The vanishing point is the place on the horizon line where perceptually all things converge. In one point perspective, the objects appear to diminish they follow a path back from the front of the scene to a single point. The orthogonal lines, are the lines that move from the object to the vanishing point. 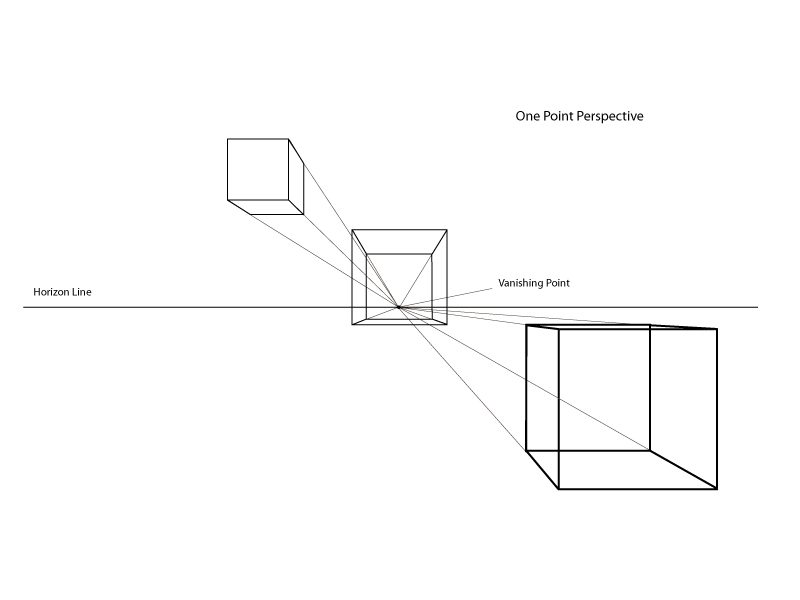 The purpose of these lines is to set up the visual path to the vanishing point, directing the shape of the object in perspective. In one point perspective all the front planes of an object run parallel to the horizon line. If the surface of the object is flat, the surface will appear to be directly facing the viewer. When drawing a cube the edges of the cube will be perpendicular to the horizon line and the top and bottom of the cube will be parallel to the horizon line. From the front edge of the cube, the orthogonal lines will follow a path back to the vanishing point. In the example the edges of the sides of the cube will match the path of the orthogonal lines, creating the sense of depth. Remember that the orthogonal line is a guide it is not the actual edge of the object. The edges of more organic shapes will not trace along the orthogonal lines. Instead you will use those lines as a guide from the leading edge back to find how the object fits into perspective and create the shape to create the sense of space. There is much more to one point perspective, but this will give you a starting point to work from. Just keep in mind that everything will diminish in size as the objects recede in the scene and the all diminish along a path back to a single point and you will be able to work out one point perspective.